Want it all? Want a luxurious ride, all day comfort, superior engineering, rugged reliability and never-quit performance? Good luck—unless you're sitting in the saddle of a Honda Rubicon. Sure, maybe that sounds like an over promise, but just ask the thousands of Rubicon owners out there and they'll tell you it's a fact. 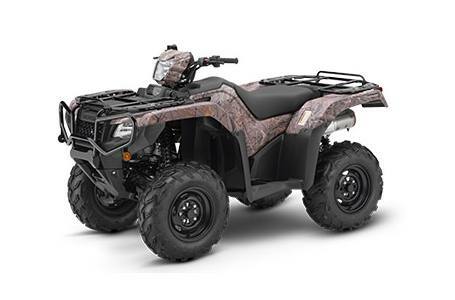 The 2019 Honda FourTrax Foreman Rubicon is a premium ATV that places a premium on rider comfort—all-day comfort. Even better, there's a wide selection of Rubicon models that we offer, loaded with an equally wide range of features, so you can pick the one that's perfect for you. Independent Rear Suspension (IRS) is about more than just comfort and a plush ride, though. The Rubicon's superior suspension engineering gives you the confidence you need to tackle rough trails, while providing day-long ride comfort and excellent traction on uneven ground. And there's tons more to talk about: refined controls, strong steel racks, inboard rear-disc brake, available Electric Power Steering (EPS). There's even a deluxe model with the paint color applied over the bodywork—a nice touch that helps deflect superficial scratches and keep your ATV looking sharp longer. So go ahead—have it all. Luxury, performance, and quality. With a Honda Rubicon, it's not a dream—it's just a great ATV. Independent Rear Suspension: All our 2019 Foreman Rubicon models feature an Independent Rear Suspension setup (IRS) that gives you a smoother ride and increased traction over uneven terrain. Honda Automatic Dual-Clutch Transmission: Strong internals, fast shifts, excellent control, true compression-braking capability in steep terrain and an automatic program that upshifts and downshifts while you concentrate on riding—the Honda automatic dual-clutch transmission has it all, including low range and a smooth shift map. It's one of the best choices you can make, and it's available on our Rubicon DCT, Rubicon DCT EPS and Rubicon DCT EPS Deluxe models. Electric Power Steering: Honda's Electric Power Steering (available on the EPS models) features sophisticated torque sensors that measure how much force you're applying and then tailor how much extra assist you need. It makes your life way easier, especially when riding over ruts, rocks, logs or on side hills. Painted Plastic Bodywork. : The Rubicon's bodywork gives it a rugged appearance. But it does more than just look good—it's designed to shrug off dings and scrapes so it keeps looking good as long as you own it. Our Matte Gray Metallic Rubicon has paint color applied over the bodywork for improved scratch resistance. TraxLok: Honda's TraxLok 2WD/4WD system offers 2WD, 4WD, and 4WD mode with locking front differential to optimize traction. TraxLok also incorporates a Speed Override mode that can be engaged when the front differential is locked, allowing increased wheel speed under severe conditions such as deep mud. Ultra Comfortable Seat: For all-day ride comfort the Rubicon's seat features thick foam and a seat cover with a “gripper" texture. It's one of the best seats we've ever engineered for an ATV. Independent Rear Suspension: The Rubicon's Independent Rear Suspension (IRS) returns two big benefits: First, it helps ensure constant tire contact with the ground for superior traction; second, it gives you an ultra-smooth ride over rough terrain, so you don't get beat up on the trail. Towing Capacity: Got a tough job to tackle? No problem—the Rubicon is up to the task. With a towing capacity that's over 1300 pounds, the Rubicon can really pull a load. Lantern-Style 50W Assist Headlight: The Rubicon features three headlights, two mounted on the front fenders and one on the handlebar. The 50-watt handlebar light moves with the bar to illuminate the area you choose and runs independently of the headlights so you can turn it on when you need it, and off when you don't. All three use multi-reflector lenses for superior light distribution. Deluxe Model: The available Deluxe models offer blacked-out cast aluminum wheels, painted body work and decals. The wheels look sharp, and shave unsprung weight. Maxxis Tires: Designed to work perfectly with the Rubicon's Independent Rear Suspension, the Maxxis tires feature an aggressive tread pattern for excellent traction in mud, sand and rocky terrain. Reverse/Parking Brake Lever: Mounted up on the left handlebar along with the parking brake, the Rubicon's reverse lever is tough, simple and easy to use. Inboard Rear Disc Brake: Tucked up inboard and out of harm's way, the Rubicon's inboard disc brake reduces unsprung weight and offers improved ground clearance. Styling: Sure, the Rubicon's rugged bodywork looks great. But it does a lot more too. It's designed to help protect you from mud and other debris, and to shrug off the dings and scrapes of the jobsite or riding in the woods. Another example? The Rubicon's all-steel full-coverage front bumper features an integrated mount for an accessory winch. Digital Display With Maintenance Minder: Digital meter display includes a Maintenance Minder system that signals when it's time for service. Other functions include trip odometer, hour meter, gear position-indicator, fuel gauge, clock, and 2WD/4WD. Emissions: Meets current EPA off-road emissions standards. Note: No operator under age 16. Honda recommends that all ATV riders take a training course and read their owner's manual thoroughly. 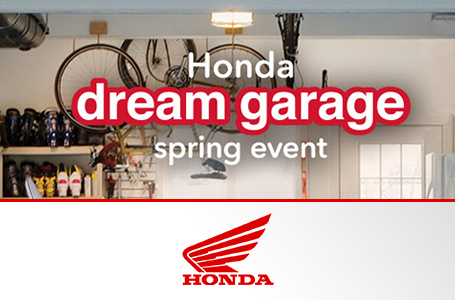 One Year: Transferable limited warranty; extended coverage available with a Honda Protection Plan. 84.5 in. x 47.4 in. x 48.6 in.